Just in terms of timing, this is one of the oddest trilogy cappers I’ve seen. Still, I think that Glass, M. Night Shyamalan’s conclusion to the story he began in 2000’s Unbreakable is really good until it’s much derided final moments (they’re too short to call an act), but I’ll get to that later. As it stands, the first four-fifths of the film is quite strong. David Dunn occupies the focus of the first act as he searches for The Beast three weeks after the events of Split. He searches different areas of Philadelphia for the man who is feeding off of young girls, using his power of vision through touch to try and narrow the search area down. The fight that ensues is perhaps a little closely filmed, but tension filled and exciting. The sudden end to it, when Doctor Staple shows up is jarring, though. However, I wasn’t ready to dismiss the movie because it had made a move that I wasn’t really expecting. The largest major section of the film occupies the psychiatric hospital of Raven Hill where Dr. Staple tries to convince Dunn, The Beast (and the Horde) that occupies the abused man Kevin’s body, and the long in keeping Elijah that they are suffering from a delusion of grandeur. It is Staple’s priority to convince these three that they are mere human and should give up their beliefs in their power. And here’s where I think the intellectual heart of the movie resides. The Beast and The Horde talk about belief. They speak of making the masses believe and of how the members of the Horde are losing belief in The Beast and his way. 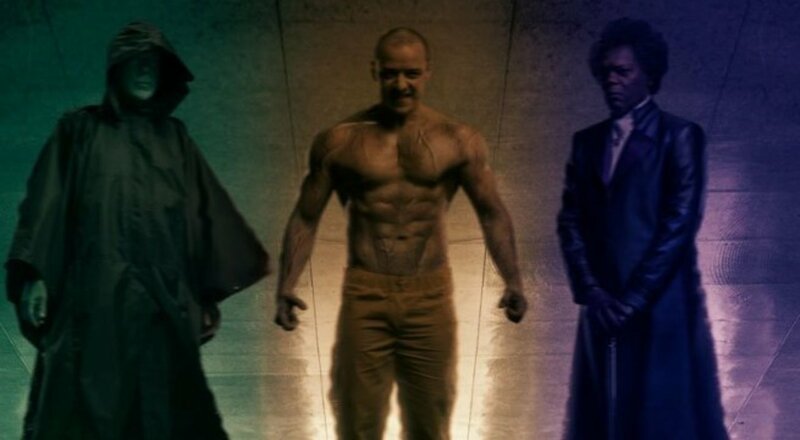 Elijah, once he begins speaking halfway through the movie and take on the moniker Mr. Glass, talks about the three believing in their own abilities. And all the while, Dr. Staple is trying to get them to explicitly not believe in the same thing. Dunn is caught in between. He, and certain members of the Horde, begin to waver in their belief in their extraordinary selves. In many ways, this central idea reminds me of The Incredibles and Syndrome’s plan to make everyone special, undermining the specialness of those who actually are special. Glass and The Incredibles could act as a pair of sister films to watch side by side. The Incredibles, though, is more successful on a basic narrative point of view, but I do think that Glass explores the central idea in a more interesting way. As Dunn doubts his own abilities over time and only rediscovers himself through the necessity to fight The Beast. Until that ending, though. I don’t hate the final ten minutes of the movie. It’s competent and sort of makes sense. The problem is the basic plot elements of the super secret anti-superhero society are so poorly established early that to turn the final moments of the film into a cathartic ending around that, instead of our actual main characters, feels incongruous at best. It’s like Shyamalan wanted to both open the door for sequels and not leave too much of a cliffhanger at the same time. I think it would have worked better if they had left out the bit about the videos going viral, and just ended with the videos showing up in our three supporting characters’ email inboxes. Still, I think the movie isn’t really getting a fair shake. The dialogue isn’t great, sharing a wordiness that’s both unnatural and perfectly in line with everything Shyamalan has ever written, but it’s well acted, looks good, and has a very interesting take on its central idea. It’s something I want to see again, not because I think I missed something, but because, now that I think I understand what he was going for, I could probably appreciate it more.